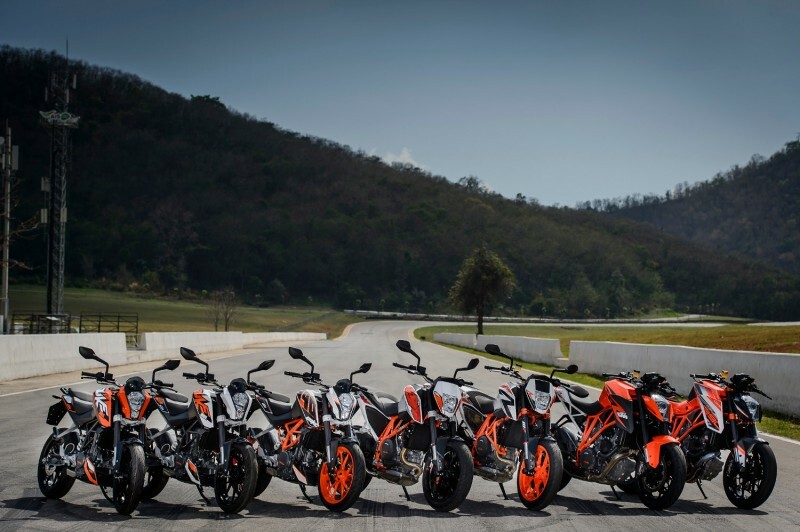 From 125 to 1301cc, the current KTM DUKE range is as wide-ranging and diverse as ever in 2015. The KTM BLOG attended the ‘DUKE IT’ media event in Thailand to ride the six-strong line-up back-to-back and found out more about the many changes that KTM’s first global superstar – the 390 DUKE – receives this year. DUKE. 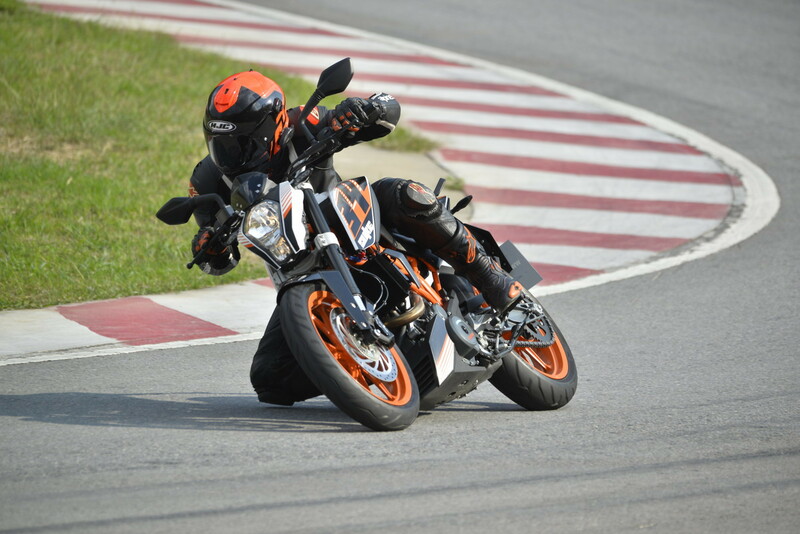 For the modern era of KTM Sportmotorcycles, this name introduced the Austrian brand to asphalt. Or should I say, it introduced street riders to an alternative way of riding with ‘smooth tyres’. 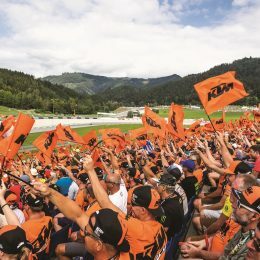 Only 21 years ago, that mono-wheeling, tyre-squealing bike quickly set an attitude for KTM and, as most of us know, reputations can last a lifetime. 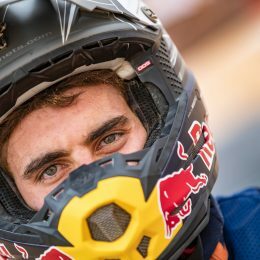 Clearly KTM has not shied away from altering this perception, only putting further fuel on the fire by adding more performance, power and even a cylinder to the DUKE family. 620 became 640 became 690 which then spawned a sportier ‘R’ variant and then turned it up super-style with the 990. 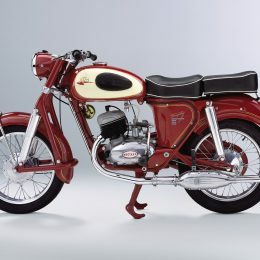 The introduction of the 125, 200 and 390 gave a wider platform to join this legendary moniker and then came … the 1290. But we all know about the ‘Beast’, so let’s rewind a little. The story of how the first DUKE was created wasn’t pretty, but sure is cool and very fitting with early era KTM; rolling up the sleeves and getting out the angle grinder. Yes, KTM and Gerald Kiska (of Kiska Design) took an LC4-power 620 Enduro (technically a 609cc) and chopped it up and slapped some 17-inch wheels on it. This concept was prettied up and, in 1994, Supermoto for the masses was born and we loved it. 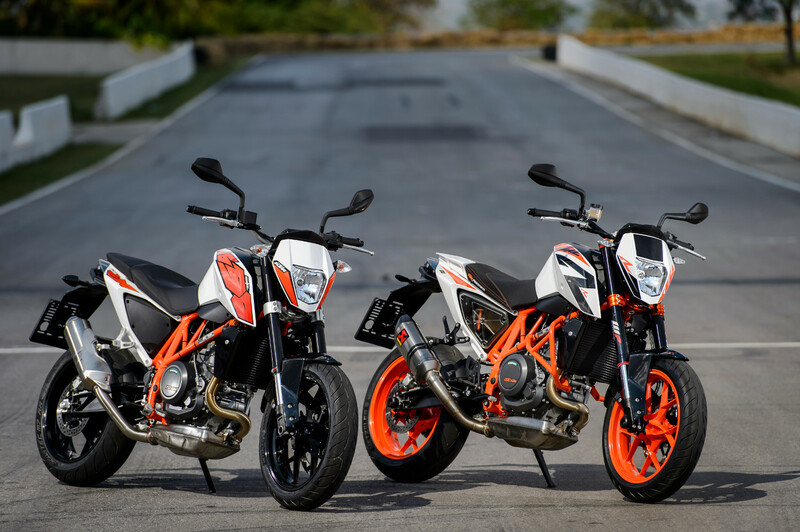 While capacities and model variations of the DUKE grew, so did KTM. 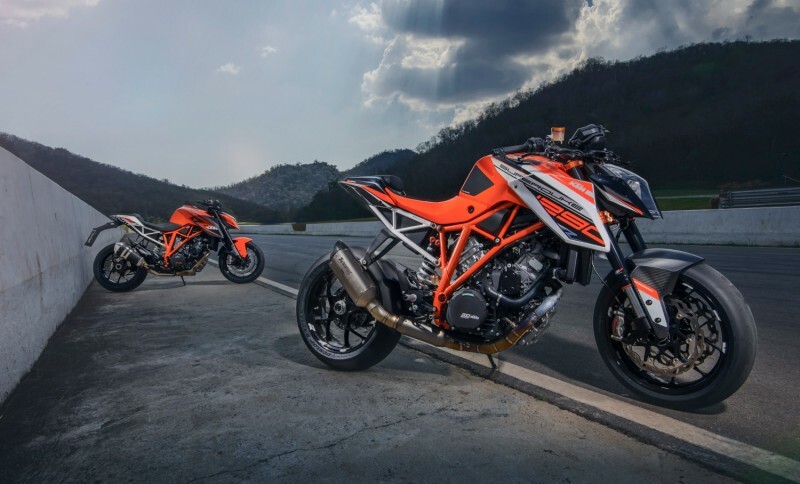 Sales rose with world championship trophies and, in 2005, the LC8 V-twin powered 990 SUPER DUKE joined the 950 ADVENTURE and 950 SUPERMOTO to show that KTM had become a true player in large capacity street motorcycles. Best of all, they did it in their own way and didn’t follow pre-existing patterns. 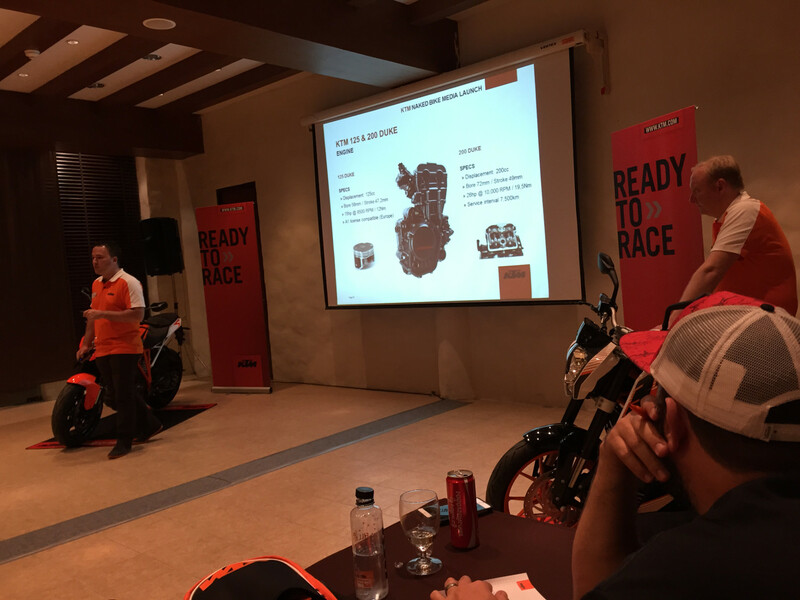 So DUKE motorcycles have always had to carry an edge and attitude and, from the current range of six machines (125, 200, 390, 690, 690 R and 1290 SUPER DUKE R) that is available in 2015, this character prevails and gives riders of all ages and experiences a chance to own a true sporty naked machine. For the first time ever, KTM assembled its current full aggressive and wide-barred range in one place for the world’s media. 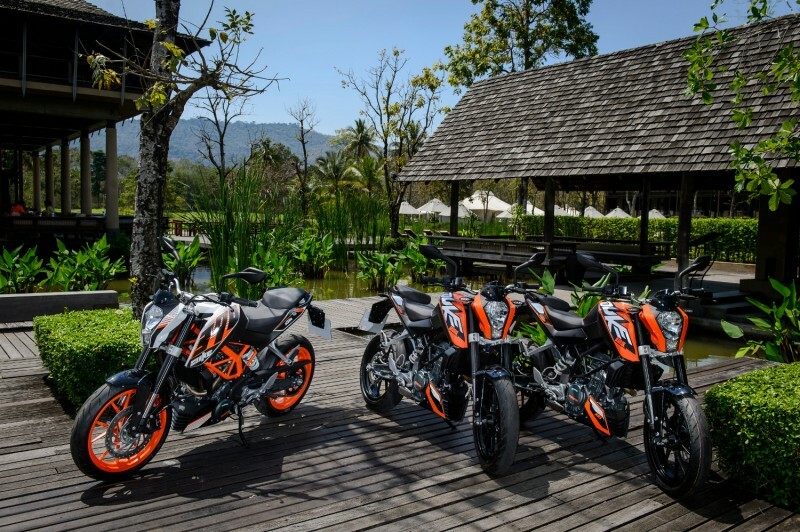 Thailand’s Khao Yai National Park and the nearby Bonanza Speedway played home to the ‘DUKE IT’ event in late February and the KTM BLOG was fortunate to attend. Arguably, the current DUKE line-up is still very fresh with the ‘oldest’ bike here being the 2011-born 125 DUKE (which itself saw a major change in 2013 by being the first 125 to be fitted with ABS as standard – a major safety initiative). All bikes have seen minor technical upgrades each year – most so small they aren’t really talked about and are just about refinements. 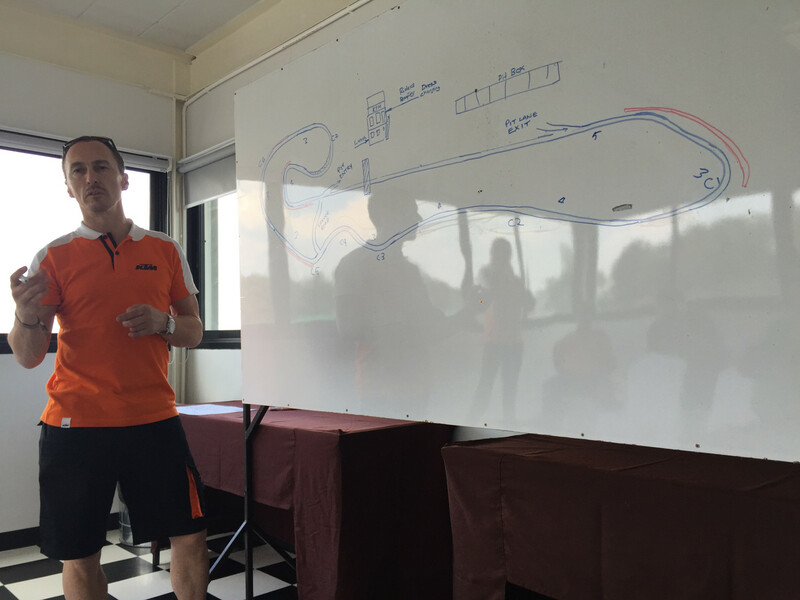 KTM’s Press and PR Manager, Thomas Kuttruf and Head of Product Marketing, Diego Arioli, talked us through the range on the evening prior to riding to give us maximum saddle time beneath the hot Thailand sun the following day. Apart from the addition of ABS in 2013 and the white colour option, the 125 DUKE has been mainly concentrating on being the most popular 125 in Europe since it was launched in 2011. Sharing the same chassis platform as its 200 and 390 brothers, the smallest DUKE is still a proper motorcycle – not a pretender – with a huge array of official PowerParts to personalise this charismatic machine. The biggest selling KTM street bike globally, I was reminded of how fun the 200 DUKE is on a short thrash from the KiriMaya Resort to the Bonanza Speedway. Although a small engine in the grand scheme of the range, the popularity of this bike comes mainly from countries where licencing and tax laws sees this as a luxury, big capacity machine. With top level suspension and braking components and plenty of punch from the engine, it’s easy to understand why the 200 has been such a success story in just two years. The first KTM that is truly available globally by being present in every single market that the Austrian company has a presence in. So what’s new in 2015? Quite a lot. The already powerful, refined and economic engine is treated to an anti-hopping clutch to calm over-enthusiast down-shifting and an improved generator from the RC provides a better electrical power output. A big change that can be felt at the wrist is the reduction in throttle travel, down from 88° to 77°, meaning less of handful needed for the same results. A new seat is meant to increase comfort whilst having a stronger as not to flex and place any pressure on the top of the airbox. Further aiding the comfort theme are improved handlebar grips and Pirelli Diablo Rosso III tyres are now fitted to the orange wheels for sportier riding and the indicators are more robust. Despite the speed limits in place in the Khao Yai National Park, the 390 DUKE was so engaging around its undulating roads that are littered with positive and negative cambered switchback hairpins, blind crests and sometimes covered in leaves and elephant poo. I gave the ABS and mega brakes a good test a couple of times. The engine is just as happy being thrashed for its top end rush or can pull out of slower corners easy, even when in the wrong gear. It isn’t just on the road the 390 excites; I used the bike to learn the Bonanza Speedway and had a mega time trying to keep up with thumping 690 DUKEs. Braking performance is excellent and the chassis coped with the mixture of smooth, fast turns and bumpy hairpins. Despite being unadjustable, its testament to the suspension quality of being able to deal with such a wide range of use and ground clearance only became an issue on some corners. For new riders, the 44hp is delivered perfectly and addictively throughout the rev range and for experienced riders there’s more than enough to satisfy and allow you to concentrate on exploiting that fantastic chassis. For most of us, 390 is more than enough. A bike that can be ridden to work in the week and thrashed at the weekend. For 2015, the 690 DUKE receives new graphics in each of its white or black options including decals on the wheels. The new look is a little more youthful than previous and once behind the bars that’s just how I feel; the bike is so easy and fun to ride. It’s no surprise that one major training school that runs three 690 DUKEs has repeatedly recorded 100% monthly pass records on this bike. Light, low and narrow, the chassis is steel tubular and ready to race built, naturally. But it’s the engine that does it for me on this bike. LC4 – where the DUKE family started. Single cylinders punch like no other and KTM has refined this unit so much to be the most powerful production mono, while also giving long service intervals, smoothness and incredible fuel economy. Oh, and big wheelies are still on the menu. They’re legal in Thailand, right? I own a 690 DUKE R, so I’m very biased when it comes to this bike. The orange wheels are a welcome addition for 2015 and visually help set it apart from its non ‘R’ stable mate. While the R commands a higher price tag, the components and capability make it night and day different compared to the base model. Besides, you wouldn’t be able to turn a 690 DUKE into an R with the same PowerParts without spending twice as much! Very similar in specification to the machines that powered the 2012 World Superbike-supporting KTM European Junior Cup, the potential of the R’s chassis is perfectly capable for riders looking to humiliate big bikes on their favourite track. KTM test rider, former MotoGP rider and arguably the Peter Pan of motorcycling, Jeremy McWilliams was on hand at Bonanza Speedway and dialled in a setting that saw us gain ground on the 1290 SUPER DUKE R in the more technical turns of the circuit. Do not underestimate the R.
The Beast is still fresh from ripping up the tarmac throughout 2014, so remains unchanged for 2015. Despite its nickname, the bike has actually proved to a lot of riders – including me – just how useable it is on the road. The riding position is actually all-day comfortable (as long as you keep the speeds down for long durations to avoid a sore neck from hanging on so hard!) as KTM has somehow done the impossible of getting that headlight and multi-function clocks to deflect wind very effectively. 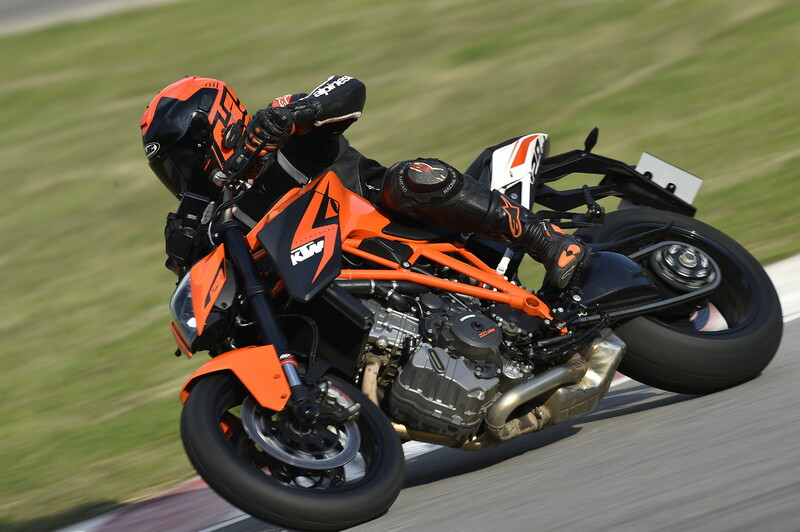 The chassis isn’t like the extremes of the uber-aggressive, super-firm 990 SUPER DUKE where you sat on the bike with what felt like the front wheel under the seat, but the 1290 SUPER DUKE R is still massively capable on track (more of that in a bit). But this bike is about the engine. So much performance in every gear; be lazy at low revs or chasing the redline – it just shoves forward relentlessly. The sophisticated MTC (motorcycle traction control) keeps it pointing forward (sometimes a little skyward) safely for those of us without the most sensitive of right wrists; if it wasn’t for the warning light flashing up on the dash you wouldn’t know the software was working hard to not stop orbit-level highsides. Of course, for the hedonistic out there, the electrics can be turned off and hang on to the wildest ride on two wheels. Yeah, I definitely do that and check twice before heading on circuit. Only 30 minutes ago, the same man was only telling me to ride at 80% of my ability at the circuit as there’s not much run off. With the shine off the tyres and the bike power-wheelying out of a third gear corner, the potential of this set-up is soon evident when trying to follow McWilliams on an identical bike. He’s not pushing, but he soon clears off and the rest of my session goes by so fast (not me, going fast I should add). But the feeling is addictive. The bike flatters my ability and I want another session. So, in summary, who needs a full fairing?! 3 Responses to DUKE IT! 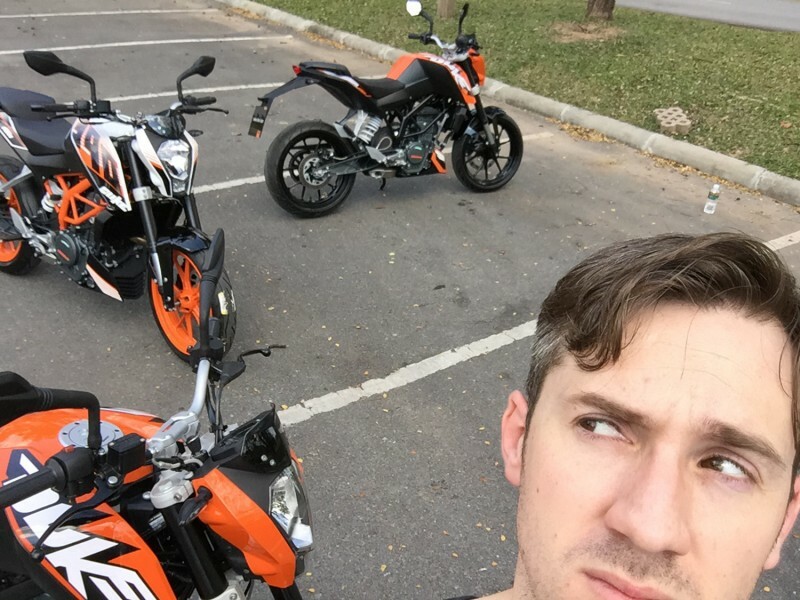 there is huge confusion over what markets got what if any changes to the 390 duke models for 2015 hopefully KTM can clarify.